Are you a yoga sceptic? Have you been curious about challenging your sceptical thoughts? Earl Ofari Hutchinson, author of ‘A Skeptic’s Journey through the Yoga Experience’ has joined me today for a quick chat about his journey as a yoga sceptic. Earl, can you give us a brief overview of what you cover in your book and what you set out to achieve? ‘A Skeptic’s Journey through the Yoga Experience’ takes a hard and personal look by one who once held deep skepticism about yoga at the history, the myths, the controversies, the practice, the philosophy, the growth, commercialism of, and impact of yoga. The book examines the racial and gender conceptions and controversies that confront yoga, as well as the controversy and debate over the physical hazards of yoga to men especially. ‘A Skeptic’s Journey Through the Yoga Experience’ is a small primer that aims to give a skeptic’s impressions of some of the hot button issues and controversies in the yoga world-gender, race, physical hazards, men, and women, commercialism, and the future. It in no way pretends to be a comprehensive and definitive study of yoga. Throughout the book I share three years of notes from my journal that give my reflections, insights, feelings, and thoughts about the various poses, movements, and mental and physical changes and benefits of yoga. What inspired you to delve into the world of yoga in this way? I got the idea after doing yoga for five years and seeing so few men, especially older men, in yoga. So it is a book by and for them. I like that you’ve drawn on your new life experiences to help others like yourself. Yes, it takes a willingness to be open to new experiences. And I have always been. If there was one thing you hope readers take from these experiences, what do you hope it is? That yoga can help anyone–mentally and physically, especially older men. Finally, looking back on the development and publication of ‘A Skeptic’s Journey through the Yoga Experience’, what did you feel was your greatest reward? Earl, unfortunately, we’re out of time today, but I hope you get to share your experiences with others for years to come through ‘A Skeptic’s Journey through the Yoga Experience’. Excited to read the book we discussed today? Find it here on Amazon: ‘A Skeptic’s Journey Through the Yoga Experience ( ASIN: B076GPX2MQ )‘. 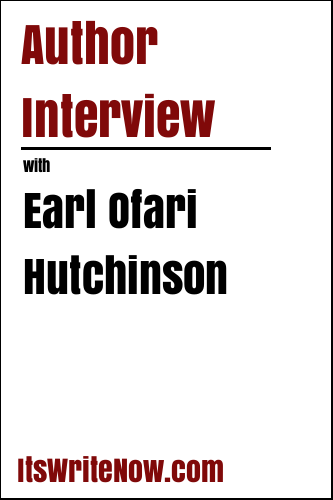 Want to find out more about Earl Ofari Hutchinson? Connect here!